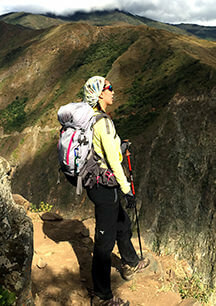 The Inka Trail to Machu Picchu Package combines the best of Cusco City with the most amazing Trek in the World. Hiking the Classic Inka Trail is a “once-in-a-lifetime” experience. With breath taking views of the Andean Mountains and archaeological wonders dotted along the way, it’s easy to see why the Inca Trail has been voted one of the ten best hikes on this planet. Upon arrival to the airport of Cusco, you will be welcomed by our representative, who will drive you to your hotel in Cusco. later we will explore the amazing and historical city of Cusco, which was the capital of the great Inca Empire and surrounded by the beautiful Andes Mountains. In the Afternoon you will begin your tour visiting the Plaza de Armas-Main Square. We will continue our tour exploring the Cathedral and admire its exquisite vestibules and priceless paintings from the Cusco School of the 17th and 18th centuries. Just a few blocks away you will visit the famous 12 angle stone and Loreto Street, nearby you will visit the Qoricancha or Temple of the Sun in Incas time, whose interior walls were said to have been covered in gold. As you return to the lower part of the city, you will stop off at the San Pedro Market, where you will be delighted by the variety of unique and traditional local products and discover new aromas and tastes. Today you will experience a guided excursion to the enigmatic Sacred Valley of the Incas, we will start at 08:00 a.m. and while driving you to Pisaq passing through the animal sanctuary of Cotahuasi where we can see Pumas, Condors, Llamas, Alpacas, Vicuñas and Guanacos. It’s then another 30 minutes driving to Pisaq, where we visit the archeological site and the local market. After seeing and visiting the handicraft market we will continue our journey passing the Sacred Valley until we arrive to Ollantaytambo – “The Last Living Inca Town” an old Inca fortified village where we will observe some of the best examples of Inca architecture in the region then on your return we will arrive to the unique Archaeological site of Moray, where we will learn about the ancient Inca farming technology then we will return to your hotel in Cusco. Your first day of the Inka Trail you will be picked up from your hotel between 4:30-6:30 am (depending on location) and we will drive to KM. 82 – arriving at approximately 8.00 am. After a delicious breakfast we will head straight to the checkpoint to begin the Inca Trail to Machu Picchu. It’s a relatively easy two-hour walk to Patallacta; the first Inca site along the trail. From a unique, secluded location we will enjoy the breathtaking views of this ancient city throughout an energizing yoga and meditation session. It’s then another two-hour walk to Hatunchaca – located in the heart of the Inca trail – where lunch will be waiting. We will walk for another two hours to the first campsite located in Ayapata, arriving at approximately 5:00 pm. Your tent, a snack and a hot drink will be waiting for you. There will be time to rest and enjoy the view of the mountains before dinner. We will wake you up bright and early with a hot cup of coffee or cocoa tea. Today will be the most challenging day of your Inka Trail to Machu Picchu and after breakfast it’s a 4-hour trek uphill to Dead Woman’s Pass. At 4215 m / 13829 ft., this is the highest point along the Inca trail. At the summit, we will take time to appreciate the serenity of this location while your guide completes a traditional offering ceremony to the Apus (local Gods). After a 2-hour downhill trek to Pacaymayu Valley we will enjoy a well-earned lunch. The second pass is an easier 2-hours climb and we will take time to explore two Inca sites along the way; RuncuRaccay and Sayacmarca. It’s then a 20-minute walk to the second campsite at Chaquicocha (dry lake, 3600 m / 11811 ft.), where you will be able to admire a beautiful sunset over the Vilcabamba mountain range before dinner. With an unobstructed view of the constellations, this is the perfect place to stargaze! With the hard part well and truly over, you can relax and enjoy the easiest and arguably most interesting day of the trek. Today’s route is extremely varied and it is only a 5-hour walk to the final campsite. Along the way you will pass through a number of different ecosystems, experience the atmospheric cloud forest and observe the magnificent panoramic view of Salkantay Mountain (the second highest in Cusco). We will visit two Inca sites; Phuyupatamarka (City in the Clouds) with spectacular views of the Urubamba River and the Machu Picchu mountain, and Intipata (Terraces of the Sun). At Intipata, there will be time to rest and take in your magical surroundings during another meditation session. We will reach the campsite at approximately 1:00 pm to have lunch and you can then enjoy some free time to relax and unwind. Later in the afternoon we will visit another impressive Inca site – Wiñay Wayna – where your guide will explain the history of this remarkable location. We will then return to the campsite for tea and dinner and a special surprise! On our final day we have to get up very early to prepare for the highlight of your Inca Trail to Machu Picchu – the Lost City of the Incas. We will go straight to the checkpoint and wait until it opens at 5:30 am. As the sky brightens, we will walk for an hour to the Sungate, taking in the stunning views along the way. On a clear day you can watch the spectacular sun rise over Machu Picchu from the Sungate, which is truly an unforgettable sight. We will then start our one-hour decent towards Macchu Picchu, arriving at the final control point at around 7:30 am. Your guide will take you on a two-hour comprehensive tour of the city before leaving you in Machu Picchu to explore on your own or climb either Huayna Picchu or Machu Picchu Mountain (must be booked as far in advance as possible). Your guide will explain how to take the bus from Machu Picchu to Aguas Calientes for lunch and take the train and bus back to Cusco. We will ensure you are returned back to your hotel. Below is a list of items that we highly recommend you keep with you at all times in your personal backpack. Remember you will be carrying this with you everyday of the trek so we recommend you bring a good quality day pack which is both light and comfortable. It is important to note that due to local regulations, your backpack should not exceed 25 L. All larger backpacks can not be taken into Machu Picchu and will need to be stored outside the gates.